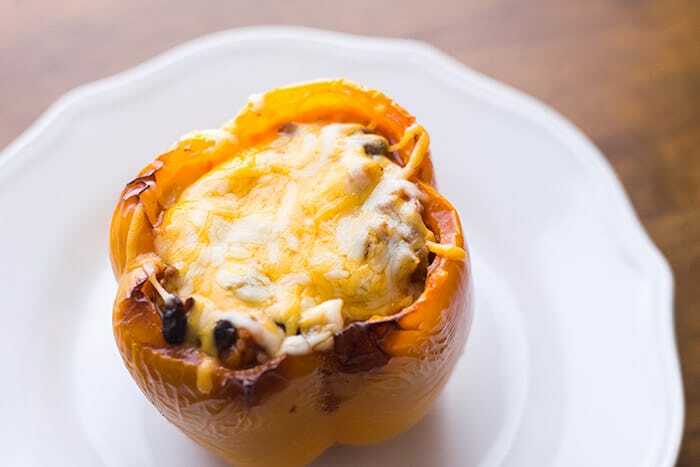 These deliciously easy stuffed bell peppers are filled with a yummy Mexican style filling. The whole family will love them! Plus, they can be on the table in less than an hour and these stuffed bell peppers are a meal just by themselves. No need to make a side dish and you can always adjust the spice of the easy stuffed bell peppers based on the flavor preferences of your family. Hi everyone, I’m glad to be back this month to share this super yummy easy stuffed bell peppers recipe. If you know me you should know that I absolutely love bell peppers! I add them to many of my dishes. My favorite are the green ones but the other colors are good too. You can prepare this recipe using the colors of your choice. Here is another one of my stuffed bell peppers recipe you may like. Easy stuffed bell peppers are one of my favorite meals to make because not only are they good they’re also really simple to make. So they’re a good choice if you’re a busy mom and need something quick for dinner. It’s always nice to have a repertoire of easy and quick recipes so that you don’t have to rely on fast food. I know it’s hard to resist the lure of fast food but I always feel better for avoiding it. It’s better for my family’s health and I save money by not going out to eat. Plus we get to enjoy each other around the dinner table. One of my favorite easy and quick recipes are molletes . If you haven’t tried them you must. They are amazing, comforting and filling. They’re also inexpensive which always make me happy. 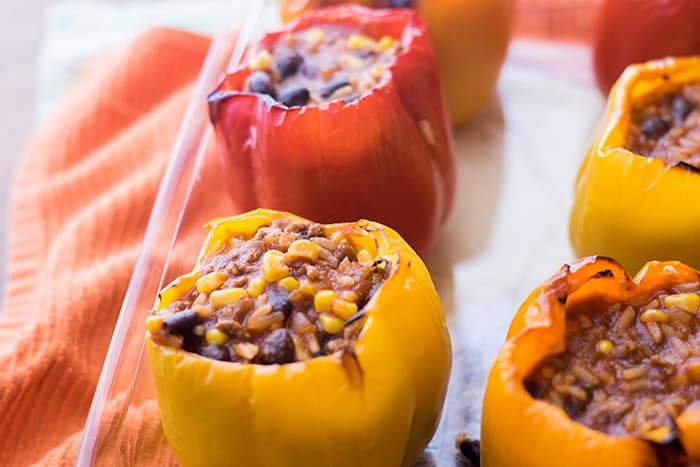 The filling for these easy stuffed bell peppers consist of ground beef, rice, corn and black beans. I seasoned the filling with a variety of spices. I recommend tasting the filling after it’s cooked to see if you want to add anymore spices. I know some people are sensitive to spices so it’s best to start with a little and then add more as you see fit. To clean the bell peppers scoop out the seeds and membranes with a small spoon so that all are removed. Adjust your seasoning based upon the flavor preferences of your family. Cumin will give a smokier flavor, while chili powder is mild because it combines other spices within the powder. To ramp up the spice try adding cayenne pepper. A glass Pyrex dish works well for baking these because it is easy to clean up. If you’re using a baking sheet, put a layer of tinfoil on the bottom of the sheet to make a clean up easier. If there’s any leftover filling, it is perfect for taco salad or burritos. 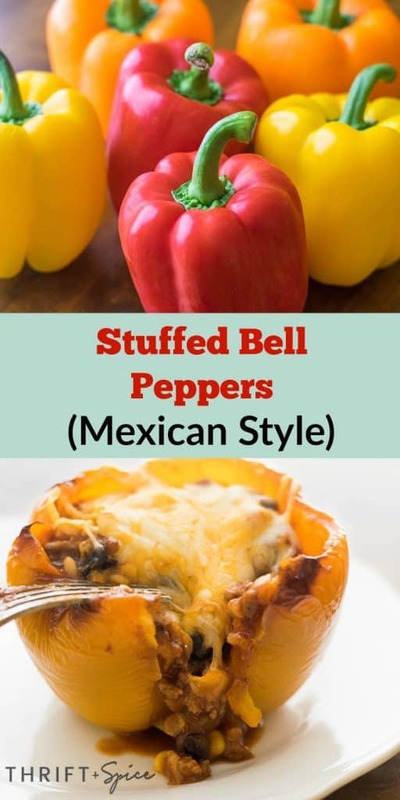 If you’re looking for easy stuffed bell peppers that incorporate a bit of Mexican flair then this is the recipe for you. 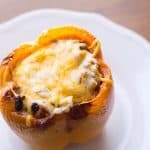 With rice, beans and ground beef you take stuffed bell peppers to a whole other level with this easy stuffed bell peppers recipe. If you're looking for easy stuffed bell peppers that incorporate a bit of Mexican flair then this is the recipe for you. Add the chili powder, garlic powder, onion powder, cumin, salt and black pepper. Stir well. Next add the beans, corn and tomato sauce and stir well. Add the ½ cup of rice, ½ tsp of salt and 1 cup of water to a pot and bring to a boil. When the rice is done stir it into the meat mixture. Scoop out the seeds and membranes with a spoon. Then top with some of the shredded cheese. Bake in the oven at 350 until the cheese is melted. I hope you try this easy stuffed bell peppers recipe out. I know you will love it! I’d like to leave you with one more recipe that is perfect during the cold seasons. That recipe is this delicious chili. It’s one of my most popular recipes.